Congratulations to Ty Ingram who was named "Top Gun" at the most recent Opti US National Team practice at Larchmont YC. 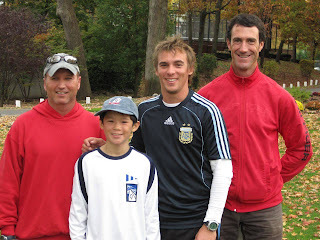 Ty (photo right) along with USNT head coach Scott Norman, and coaches Fran and Richard. LISOT sailors have a long tradition of being named "Top Gun" - including in recent years: Jordan Factor, Megan Grapengeter-Rudnick, Lily Katz, Dierdre Lambert, Andrew Mollerus, Elliott Morrill, Matt Wefer and Declan Whitmyer. For those not familiar with Top Gun, only one sailor is named Top Gun at each USNT and USNDT practice. The recognition is based on a vote by the coaches and prior Top Gun sailors in attendance at the practice.